Subject: Havoc's Wolf3D Editor (HWE) - Version 0.3.13 released! I just released HWE (My Wolfenstein 3D editor). You can find it here! At the moment it's just a map editor, but it's going to be a full featured editor in the distant future. Please tell me what you think about the editor and feel free to post bug reports or feature requests in this thread here or send them to me via email. I was waiting for this but it turned out that I didn't have the time to try it today. Will try tomorrow as soon as I get the chance. I've checked is and it looks wonderful Especially for a fisrt version - this is most impressive. Especially love the map symbols editor and the "find and replace'. It's very comfortable for mappers and I'm sure many modders will use it now. Being a ChaosEdit regular, I still miss the 3D preview with a more visual texture and sprite selections/inserting....which makes it easier to do many things, incuding fast preview of texture look in games. Now - some first "improvement remarks". 1. "Find and Replace" window should not auto-dissapear after first search, to allow easy "find next" (otherwise "find next" looks redundant ). For the same reason it should remember the object/wall choice of previous search - as those often come one ofter another. Also I'd default it to objects rather than walls, as objects are usually much harder to find on a map than walls, that usually come in lines. Also you probably should allow to search using words of object description as well, and not only objnums. 2. Lacks "recent opened projects" option in the File menu. 3. Most "Map View" options seem redundant....what would someone want to look at the map without doors...or keys....or secret elevator? IMO this list should be cut at least at half. Or you can at least hide those under "advanced" button. ...what is "other tile"? This will feature will come in the future, when the graphics editing part is included in the editor. After your first search you can use the F3 key in order to perform the "find next" / "replace next" option. The previous search is being "remembered": You just need to reverse the search direction in the search dialog. RTM! Well, you just need to change the plane in the search dialog. I don't see a problem with changing the plane before performing the actual search as you've to open the search dialog the first time you search for something anyway. Okay, I'll add it in the next version. I take this into consideration, but I'm not sure, if I'm going to add this anytime soon. This is a feature that Codetech84 requested: Being able to show or hide objects which are in a certain category. If you want to deactivate all objects of a certain plane, you can still do it by unchecking the plane in the "Draw map planes"-list. You're also free to remove or edit categories by using the map symbol types manager inside of the map symbol manager. Maybe I should give the map symbol types manager its own option in the menu, but I don't know yet. "Other tile", can be used for objects that aren't easily assignable to an already existing category or if the object is unknown (which is the case for some of the third-party games). Can I give you "requests" I need from such graphic editing tool as a Spriter? I don't know, that would mean to have another dialog box just for these viewing options. I don't want that the editor is starting to become (too) confusing. Subject: Havoc's Wolf3D Editor (HWE) - First public version released! Ok. Here list of my "wishful" requests for the future art editor (at least what I can think of now). 1. Any feature already implemented in RecolorBMP and/or SpriteMaker will be welcomed - especially recoloring options. If you can even merge those 2 "godlike" tools in the same window - can be most cool. 2. "Multi-insert". It takes lots of time to insert 16 sky frames into VSWAP, the same for HUD faces etc - I'd like to have an option to browse/select multiple frames to be automatically inserted one after the other. Even cooler is ability to autosplit loaded 64x16 image into 16 sequential frames - aka "Sky inserter". This will save me alot of work making new skies. 3. "Multi-extract/extract all" (like in GFE). Talks for itself. This is something I really lack about ChaosEdit. 4. (This one I REALLY need) Floor-maker autopreview - when this checkbox checked - the texture is shown with autoduplications from all 4 sides - and when I edit the center image - the rest are dynamically updated to show how this wall/floor is fluidly repeatable in all 4 directions at every point of editing. Can have one checkbox for walls - with only horizontal duplications - and the other for floors - with vertical ones added. 5. Sprite Animation preview - animates next 3-4 frames in the VSWAP. 6. (this one is really wishful thinking) "Parent wall". Ability to define a wall as "version" of other basic "parent" wall. This way any editing to the main wall will automatically be transferred to it's "sons" (as sometimes you add small thing too all walls of this "parent type"). The same can be cool for animated sprites - define first frame as "parent" - and auto-transfer the changes to all animation frames - if this option box is "checked". I've just had a play with your editor Havoc and it looks really good, you've taken some of the better options from all of the previous Wolf editors and put them together. I have a couple of suggestions, well wishes actually! - Is it possible to add the 3d screen that ChaosEdit has? I do a huge amount of mapping using that screen to see what things are going to look like inside the game. I know this probably isn't an easy thing to do though. - I love the flip/rotate option on the maps but is it possible to add functionality for a cut or copied 'section only' of the map to do the same? This is something I've always wanted within an editor's functionality. - Is it possible to add a mapping grid? I couldn't seem to find one. - Is it possible in increse the size of the mapping screen? - Being someone who's eyesight isn't 20/20, I found the mapping and door symbols to be quite small and fairly hard to define, is it possible to make them like 50% larger at all? These are mostly just small things but they would sure make the mapping experience a lot easier for me! Nice work so far Havoc. Yes, this is planned to be included in the next version. I didn't find this feature too important for the first release. Well, in the current version of HWE there isn't one, but it's going to be included in the next version. I've already implemented both features (changing the editor's size and zoom functionality) in my current build of HWE, so yes, these features will come in the next version of HWE. Oh hell yes. I needed a dedicated map editor to work on my mod further (sound issues, it's complicated), and this looks like it'll fit the bill quite nicely. Looks pretty solid so far, can't wait to see it become a fully featured editor. Havoc, I think it's great that you're developing an editor and it looks good. I never really adopted any release early/often type of philosophy either. I don't think any WDC bug ever resulted in data loss. The releases were pretty quick in 2003 and 2004, but a lot of that also included adding feature, not just bug fixes. And once you start cramming a bunch of functionality in there and try supporting several different games, it becomes more difficult for one person to test every aspect of the editor in a reasonable amount of time (you wanted that this year, or next?). I haven't taken any offense, but I just wanted to clear that up. - Rotate map does not take door, guard, player, and turning point directions into account. - Changed map planes to 5. It appears that this caused the files to be saved, but was not warned beforehand that this would happen. - Every time the files are saved, the progress windows always says "Saving maps..." even when it appears to have completed. - Doesn't save the last folder used between sessions. I must navigate to the folder each time I start the program. - Autofloor puts a different floor code inside secret areas. The floor code should match that of the room from which the secret area is accessed. - I changed the map compression of WL1 files with 5 planes to RLEW only and when I saved and reopened my maps I got an "Access Violation at address 00401CEF". Program crashed. - I changed the map compression of WL6 v1.4 to RLEW and saved the maps. When I reopened, the program locked and crashed. - Opened WL6 v1.1 files then opened WL1 files and got "Access Violation at address 00402404". Program did not crash, but I then started getting "Access Violation at address 00404F64" errors when the mouse was over the map area and another "Access Violation at address 00402404" when I closed the program. This might be due to the previous Access Violation messing things up. A fresh install of HWE did not have this error. - Now when I open any files, I am constantly getting errors and the program is unusable. I think the MapDefs got messed up somehow. I deleted the program and unzipped it again and it worked. Granted, I contrived the program crashing bugs to demonstrate that it's difficult to "provide only polished, bug-free releases". EDIT: And I see that the mouse wheel doesn't work on WDC's map window either. Just goes to show that even after all this time (8 years! ), things can still slip through the cracks. I've only just discovered this editor thanks to Ack telling me about it. I'm thrilled - haven't played with it so far but will do. I see in response to one of Dean's queries you say you're adding a zoom feature - excellent, as that's all I'd really want - one of the reasons I love Mapedit is that the map occupies 3/4 of the screen, making it easier to see what I'm doing. I dunno, maybe it's just me, but I can seem to see my level in 3D just from the 2d top down perspective so the bigger screen size is crucial to me. WDC and Chaosedit are undoubtedly very powerful, but an advanced mapeditor reminiscent of Mapedit is all I've ever wanted. That you'll add more features down the track is exciting. I am a happy Wolfer tonight Thanks Havoc!!! I've been playing with HWE on Spear Res, changing the map tile gfx so I can see clearly on the map what's what. I'm using the SOD extension. No probs adding new map symbols for walls that aren't in the original SOD wall list. All going fine but when I add wall ID number 72, I can add it fine along with a description. but when I hover the cursor over this wall type in the map, the Tile Information area shows it as "72 - Unknown" even though it shows as "72 - Grey wall Hitler" in the Plane 1 (Walls) field above. Other new walls I've added so far show correctly in the Tile Information area. A small thing no doubt ... I'm wondering, what's the best way to create a folder for the RIP extension in the mapdefs folder? Just build it as I am and then copy the files I'm editing to a new RIP folder? Update ... the right description appears in the Tile Information area when I add or change another wall texture. It only happens with any new wall I add (not that I edit). Hi, today I've released a new version of HWE (v0.3.1). You can download it here. 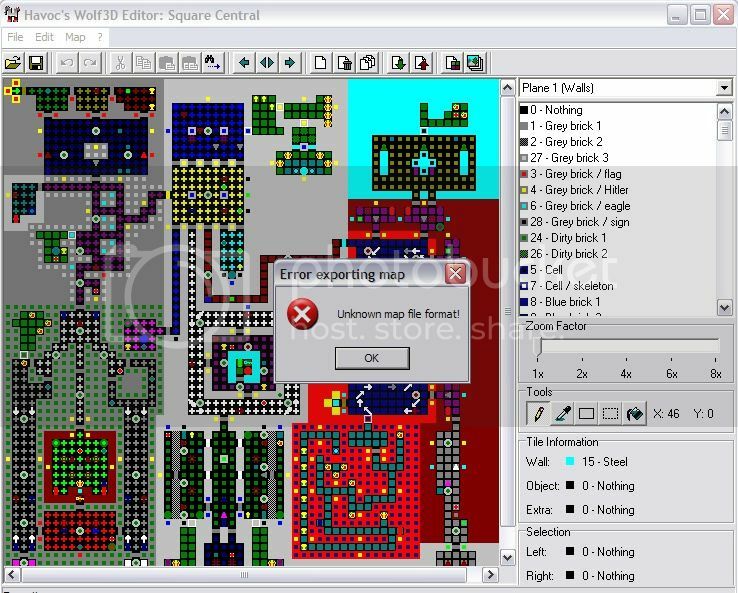 The highlights of the latest version are a map grid, zoom functionality for the map editing area, and the ability to flip or rotate a copied map part. I've also programmed a software update checker, so you no longer need to check for HWE updates on this website. I've also fixed most of the bugs you all mentioned here as well as the feature requests. I never said that. It was just a point in the listing of the RERO philosophy. I won't support any non-Wolfenstein 3D based games. So there'll be no support for such games as Commander Keen or even earlier id Software / Softdisk games. I've fixed that in the latest version. I won't add this, because I want the map planes and map objects to be as dynamical as possible, so I can't simply decide that doors are in order (e.g. vertical and horizontal) and rotating them accordingly. Changed map planes to 5. It appears that this caused the files to be saved, but was not warned beforehand that this would happen. You're right, the program should inform the user about the map saving beforehand. I've added a confirmation dialog box in the latest version. Every time the files are saved, the progress windows always says "Saving maps..." even when it appears to have completed. Doesn't save the last folder used between sessions. I must navigate to the folder each time I start the program. Bugs I found: Autofloor puts a different floor code inside secret areas. The floor code should match that of the room from which the secret area is accessed. I find it pretty farfetched to call this a bug. I just haven't included this, because of the same reason as the map symbols rotating, but I might add this in a later version, when I've more time at hand. I must admit that I've added the map compression feature just two days before I released version 0.3, and I've obviously not tested it well enough. Yes, I broke my own "philosophy" here I've fixed the bugs which caused the program to crash and also fixed some bugs in the map saving routine, when you change the map compression to something else as the default one. So it should work now. There's just one case where you'll still get crashes: If you've different games with the same file extension (e.g. WL1), you'll need to create new map definition structures to support all kind of different map configurations (like RLEW or Carmack compression), otherwise the editor will assume that the settings in the INI file are the correct ones for this file extension, even though it might be a completely different game or game version. I'll improve that in a later version. That's also why your tests resulted into crashes, beside the bugs in the saving routine. There's also another thing to keep in mind: When you add more map planes than the normal amount (which is 3), you won't be able to open the maps in WDC (or any other Wolf3D editor) anymore, because your editor adds extra variables into the map header structure, if the normal amount of map planes is exceeded, in order to determine how many map planes the map files have. My editor doesn't change the map header structure, because the amount of map planes is saved in the INI file of your map definition folder. This results into an obvious disadvantage, besides the map loading in other Wolf3d editors: You need to remember how much map planes you've had defined, if you should decide, for whatever reason, to delete your old map definition structure and create a new one. I'm not sure yet, if I should change the map planes handling to the way you did or just keep it as it is now. This was a bug which I've fixed in the latest version. I'm wondering, what's the best way to create a folder for the RIP extension in the mapdefs folder? Just build it as I am and then copy the files I'm editing to a new RIP folder? Yes, the best way is to make a copy of an already existing map definition folder and modify it to make your own map definition structure out of it. "The first rule of thumb when dealing with guards in secret rooms is to be sure the secret room has the same floor code as the room from which it is entered." I guess technically it's only necessary when guards are in the secret area. I'm not sure yet, if I should change the map planes handling to the way you did or just keep it as it is now. Leaving the decision to you, of course, I would recommend modifying the data files themselves to store this information. However, if I ever dig around the WDC code again, I don't think it would be too difficult to check for your INI file, too. I think we've a little miscommunication going on here: I don't mean to imply that this addition isn't necessary. I just wanted to say that it's a lot of work to add it, because I want to keep everything as dynamical as possible. Maybe u or someone else knows a solution? Subject: Havoc's Wolf3D Editor (HWE) - Version 0.3.1 released! Once you're in the "Export map(s)" dialog, you've to add the desired file extension (e.g. ".flr" for MapEdit) after the file name yourself (e.g. "exportedmap.flr"). Sorry about that, I haven't added any autocomplete functionality in there yet. I don't expect this mode to work on all programs but I'm guessing an easy way around this would just be to keep the maximize/adjust window size options enabled for the user after they open a project. Just throwing that out there for ya. Maybe I should release another map-editor-only update which just adds some minor features and fixes some smaller bugs. I like that idea too. Personally, I like it that HWE is just a map editor right now. I think it is the only good "just map editor" for windows out there, so releasing a version with all the small bugs ironed out would definitely be a good thing - in my opinion. Graphics and sounds! Who needs em! I'll just use variations of white noise and change my ScalePost to 1 coloured walls. Then after perfecting those, you could then release another editor that includes all of them in one. This looks like an impressive editor. I will be trying this one first! If you save your maps after you edit them (which I usually do), then exit, it will still say that you have made changes and ask if you want to save your map. I'm guessing that this could be fixed by refreshing some "changed=true" to false after you save (where it would just get set to true again if you make more changes). I can make you a video of what I mean, if you wish. For clearing a level, I didn't see an option - so I used the left rectangle tool to clear the walls/floors, then changed the top bar to Plane 2 and could clear the objects with object 000. Seems to work pretty good, and is probably safer anyway. I guess an easier work-around though, is just to press Delete Map... then Add Map (if anyone else was wondering about this). Heh. I've re-enabled the window size options, so you can adjust the window size to your preference now. I've also added a new option to save the maps in a WDC compatible format, so you can now decide if you want to save the maps in the "id Software way" or the WDC way. Of course, this option only really matters, if you decide to use more than 3 planes or activating the extended map names (32 characters) option. There are also several small bug fixes, e.g. the autocomplete functionality for the "Export / Import maps" dialogs. I hope to release the updated version of HWE this weekend. @Chris: I'll take a look at the map saving stuff in the evening. Good catch! There's currently no option to clear the maps via toolbar, but I can easily add such an option. I forgot to mention this, but thanks for adding the MRU list in v0.3.1. Definitely saves me some time. Just a quick thought I thought to interject. Make sure that you can undo clearing the entire map. I can just imagine someone accidentally pressing the button and loosing everything. Even if you show a dialog box asking "Are you sure?" being able to undo it might be nice in case someone goofs up or something.